Introducing the latest agricultural phenomenon - Ghost Chili Pepper. 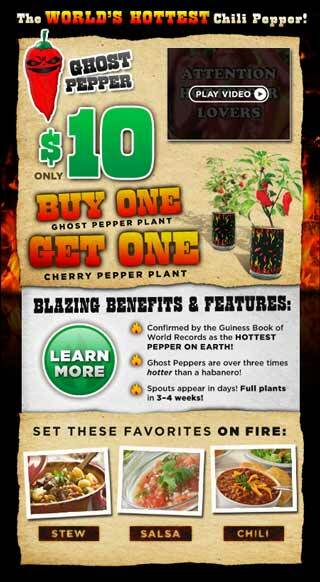 Guinness Book of World Records named the Ghost Chili Pepper the hottest pepper on earth. These peppers are 3x hotter than a jalapeno and are hard to find in your local grocery. Now you can grow your own. Growing this inferno of a chili is simple and fun. Spouts appear in just days and they're fruity in smell, but are a great addition to soup, stew, chili and salsa. Ghost Peppers are ideal for your garden to rid any troublesome insects and animals. And best of all you can grow them indoors and enjoy them anytime during the year. Order today and we'll double your order.